Whether you are an independent construction contractor or a self-employed gardener, Property Insurance Centre’s range of insurance for tradesmen is designed to suit your needs. Our specialist team will take your details and find you the best policy using our network with the top insurance providers from across the UK. If you are new to this type of insurance, here is a quick guide to insurance for tradesmen and what it is designed to cover. What is insurance for tradesmen? It is insurance which is designed for skilled people who provide a service to others (often at their client’s premises) such as electricians, IT technicians, accountants, solicitors, surveyors, cleaners, carpenters, landscape gardeners, plumbers, kitchen and bathroom fitters, carpet/flooring fitters and painters/decorators. If you do more than one type of work, most policies can be tailored to suit this as well. What type of insurance do tradesmen need? Public and products liability insurance: In case your client or a member of the public is injured, or their property is damaged or they suffer financial loss due to something related to your business or products. Employer’s liability insurance: In case a member of staff or volunteer is injured while working with you (this is a legal responsibility in the UK if you employ staff). Professional indemnity insurance: In case a client brings a claim against you for compensation. This could be due to something not working out as planned or a product not performing as expected and being unsuitable. Portable tools/equipment cover: In case something happens your tools/equipment or tools that you have hired. Business interruption insurance: In case you are unable to work or cannot continue with a job you are due to start, for example because your tools have been lost or stolen or an incident in the area means you cannot access your normal workplace. Building, fixtures and contents cover: If you work from a premise you will want to insure the building itself if you own it. Even if you don’t own a building, you will need to insure things like your fittings, stock and business equipment. Why would you get tradesmen insurance? In some cases like employer’s liability insurance it is a legal responsibility. In other cases, it is simply best practice and advisable to have cover as most people aware increasingly aware of their rights to claim against you if something goes wrong. 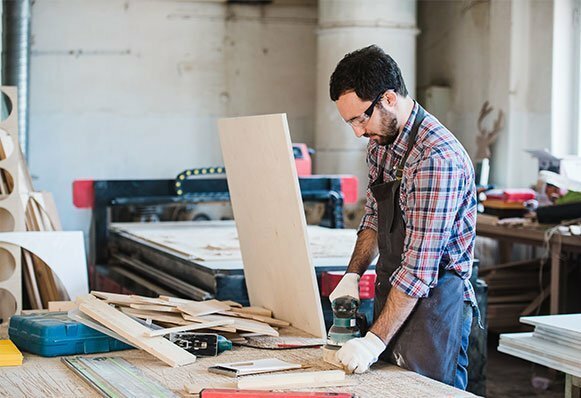 For a small tradesman a claim could lead to the collapse of their business if they don’t have the right insurance and someone makes a claim. Increasingly many organisations are asking for evidence of appropriate insurance prior to allowing a tradesman to commence work or before a contract is granted – so having the right insurance can make the difference between a job being allocated to you or someone else. How much does insurance for tradesmen usually cost? The premium can vary widely depending on the type of activity you undertake, the size of your organisation and the cost of the building, fixtures, contents and tools you use. In general policies start from around £90 per year. Where to buy Tradesman Insurance from? If you are looking for Tradesmen insurance call our new business team today on 0800 085 3761. Are you looking for Tradesmen Insurance?